Factory assembled and tested - custom Nurse Assistance control electronics packages are designed for use with logic and a hardwired type custom control panel or touch screen. Two methods of operation are available, CUSTOM VISUAL and CUSTOM AUDIO-VISUAL. TBB-2/14 - Weatherproof surface mount backbox, no knockouts, 14 gauge CRS, painted flat black, 5.25" (133.3mm) square x 3.0" (72.4mm) D.
Based upon Secure-Tech's TSS-1 intercom station, the "N" Nurse Call intercom station is designed for use in the highest security areas. 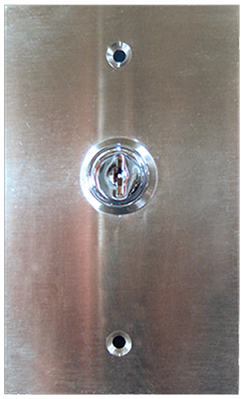 Its reduced width makes it suited for installation in security hollow metal door frames and /or window frames. Electronic devices are not installed in the station housing. 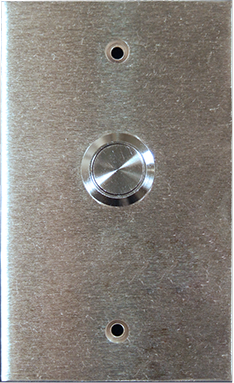 Etech Stainless Steel Plates and Switches are available with custom engraving, 3-position keyswitches (many models), key removal options, rounded plate corners and additional switches and/or LED's - Please call to discuss your project's needs. Listings: UL508; CE; UL File E131568. CSA certified class 3211 03, LR 68551. NEMA ICS5-2000: A600, Q600 . IEC 60947-5-1: AC15, DC13. 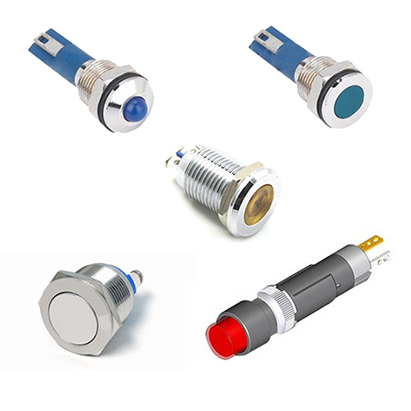 Environmental: IP65, IP66 ratings to IEC 529 Silver Contacts for high reliability. The tamperproof reset stations are designed for use in the highest security areas. Suited for both interior and exterior wall mount applications, annunciation, including nurse call (patient call-in and toilet/shower) staff duress, etc. Electronic devices may be installed in the station housing. The audio tamperproof control reset station is designed for use in the highest security areas. 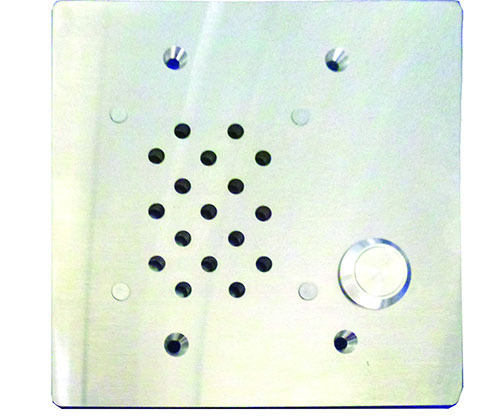 Suited for both interior and exterior wall mount applications, annunciation, including nurse call (patient call-in and toilet/shower) staff duress, etc. Electronic devices may be installed in the station housing. As a Nurse-Call Controller - 512 inputs and 512 outputs may be connected to each HC-0682 module by HC-0714-32 Input and HC-0715-32 Output modules. 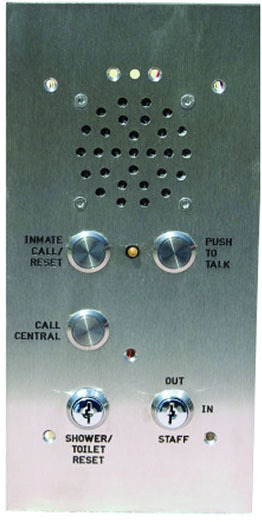 Other typical usage - control o intercoms, doors, duress, fire alarm annunciation, etc. Communication method - RS-485, program method - "C". Partial self-diagnostic, a flashing green LED and a standby (off) yellow LED indicates normal operation. Other indication combinations identify various possible errors. The HC-851 provides a communications interface for FORTY-EIGHT OPTO-ISOLATED inputs into the HC-0682 System Controller. 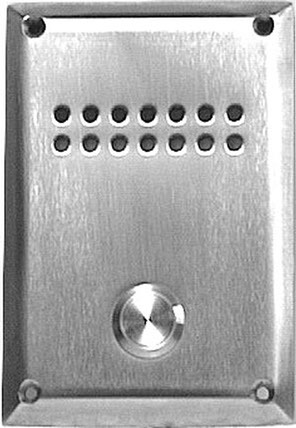 The HC-0826 is a high quality, reliable, long life intercom amplifier, for use with the HC-0644, HC-0845, and HC-0846 intercom selectors. The amplifier is suitable for the high frequency use typically found in detention facility applications. 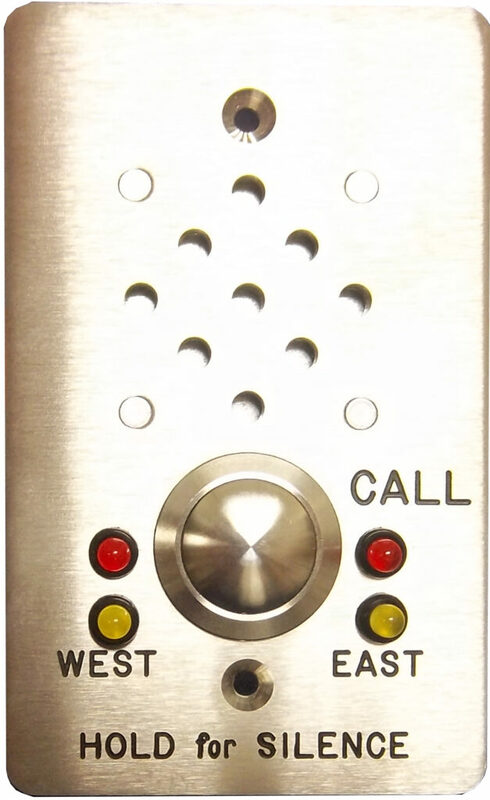 The HC-0846 provides the inputs and outputs for up to eight intercom stations or paging zones, for operation by a programmable logic controller, with access to two different audio busses. It interfaces with all major manufacturers' PLCs and the HC-0682 System Controller. STLC-TPB-037 Marine grade stainless steel, low profile, panel displacement .875" diameter. Contact rating 1A @ 50 volt, screw terminals, front panel sealed to IEC Specification IP68, (with LED, IP66)* SPST. Available with imbedded 2VDC LEDs. If replacing AML21 or AML22, use round bezel to cover the four corners of a the square opening.